Gouvermement General de l'Isle de France divise par Pays. This is a beautiful 1754 map of the Ile de France region of France by Robert de Vaugondy. This region around Paris is France's most populous province. The map covers the area from Chartres to Reims and from Marle south as far as Chateau-Landon. 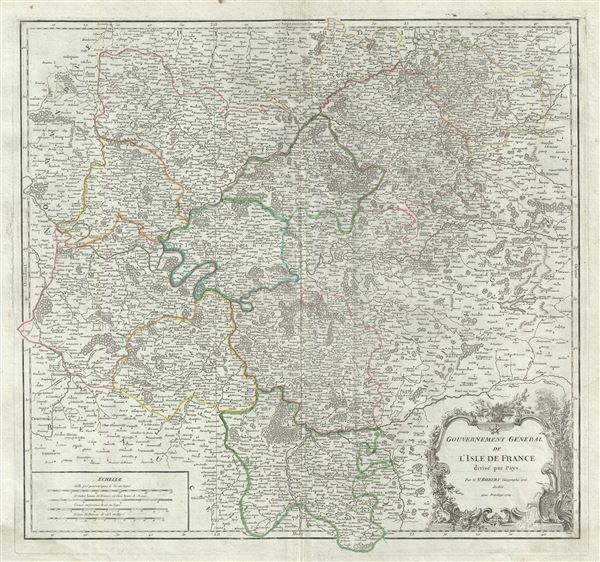 It includes the whole or parts of the French departments of Seine-Saint-Denis, Seine-et-Marne, Val-de-Marne, Essonne, Hauts-de-Seine, Aisne, Oise and Val-d'Oise. Paris figures prominently in the left section of the map. Also shows the city walls surrounding Paris as well as the ring of fortifications completed in 1848. The embastillement of Paris was perhaps the most extravagant waste of resources of the July Monarchy. Oise is known for its production of Maroilles, a cowÂ's milk cheese. This cheese is produced in rectangular blocks with a moist orange-red washed rind and a strong, distinct odor. The Seine-et-Marne region produces a wide variety of wines and hosts an annual wine and cheese fair. This area is known for its production of a brie-style cheese called 'Fromage de Meaux.' Over 25 liters of milk are used produce just one wheel of this raw-milk cheese. When ripe, its rind breaks at the slightest touch, allowing the beautiful, hay-colored, almost liquid paste to ooze out. The map includes a beautifully engraved title cartouche in the top right quadrant. This map was drawn by Robert de Vaugondy in 1754 and published in the 1757 issue of his Atlas Universal. Rumsey 3353.029. Pedley, Mary Sponberg Belle et Utile: The Work of the Robert de Vaugondy Family of Mapmakers, 113.